Joseph Patrick was born 20 April 1872 (birth certificate number 1872/14858) in Helensville in the southern Kaipara region. We suspect that his childhood was much the same as other children at that time growing up in the Kaipara area. Joseph went to Dargaville at 19 years of age where he became Captain on one of the river rafting steamers, and later bush manager of the Lamb Timber Co. He was secretary of many organisations – The Dargaville Racing Club, Northern Wairoa Jersey Breeders Association, Northern Wairoa Rugby Union, Hobson Acclimatization Society, Time-keeper of Dargaville Boxing Association. On 27 August 1902 Joseph marries Ethel Flora McCabe (Certificate number 1902/3413). Ethel was born on Graham Street in Auckland, New Zealand on 14 April 1878 (Birth Certificate No.561). 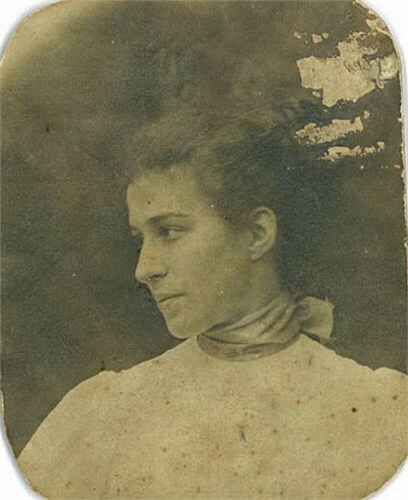 Her parents were William John McCabe, occupation – Marriner aged 34 born in London (1843–1899) and Winifred Carey aged 32 born in Sydney, Australia (1847–1880). Ethel Flora McCabe – Hill Family Collection. 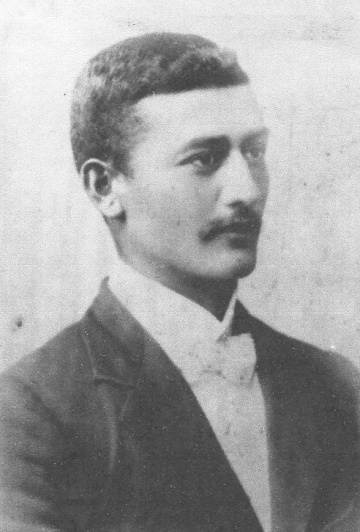 A quiet but very pretty wedding took place yesterday at St. Patrick’s Cathedral, when Captain Joseph Stanaway, of Aratapu, Northern Wairoa, eldest son of Captain Henry Stanaway, of Helensville, was married to Miss Ethel Flora McCabe, daughter of the late Captain William McCabe, of Northern Wairoa. The bride, who looked charming in a beautiful fawn silk costume, was attended by Miss Annie Stanaway and the bridegroom had as best man Mr F Macmanemin. The Rev. Father, F. Buckley, assisted by the Rev. W H. Corcoran . (Puhoi) and the Rev. 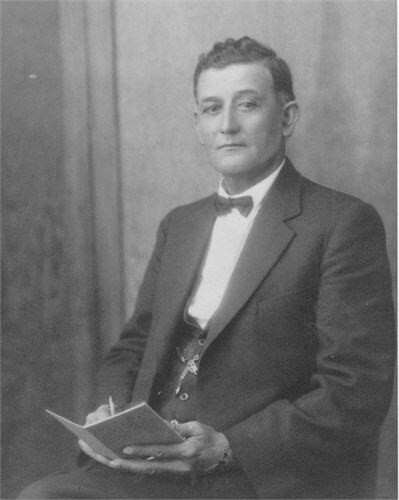 M. J. Brodie (Waihi), performed the ceremony. The young couple were the recipients of many choice and valuable presents. William was born in London and Winifred was born in Sydney, they were married at St Paul’s Church on 11 June 1867 in Auckland. Ethel’s mother died when she was only 10. 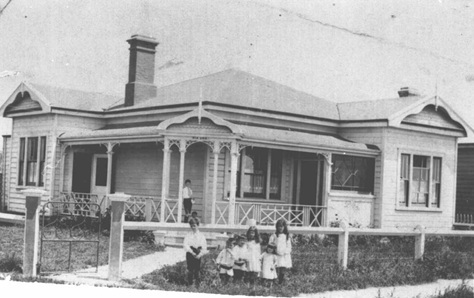 Her father moved the family up to Te Kopuru where he died on 22 September 1899. In 1903 on 25 June Joseph and Ethel have a son Leonard Joseph. Auckland Star 10 June 1903. The first record we have of Joseph is from the 1905 Electoral Roll where he is listed as living in Aratapa and his occupation listed as a Master Mariner (this was when he worked on river rafting steamers). The Electoral Rolls from 1911 through to 1919 have him living at Mangawhare, still listed as a master mariner. Kia Ora – Family home at Mangawhare – Hill Family Collection. Joseph built their family home named “Kia Ora” which means Good Luck, at River Road, Mangawhare which is at the junction of the Kaihu Creek and the Wairoa river. 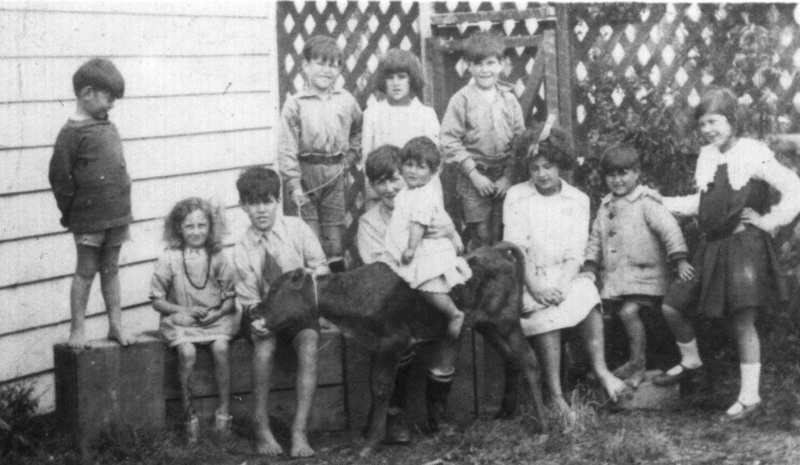 Between 1905 and 1918 Joseph and Ethel have another 10 children, 4 daughters and 6 sons. Mary Agnes 1905, Desmond Paul 1906, Norah Patricia 1907, Gerald Patrick 1909, Joseph Henry 1910, Rose Winifred 1911, Patrick 1913, Owen Anthony 1914, Maurien Fredrica 1916, and David Grant 1918. Joseph and Ethel’s Children – Wendy Lever Collection. In 1917 he is placed on the WW1 Reserve Roll. In 1919 he is now secretary of the Northern Wairoa Racing Club, on 19 December 1919 he places notices on behalf of the club in the Auckland Star. It seems that by the 1928 Electoral Roll, Joseph has had a change of occupation now working as a secretary and then by 1933 working as an Agent and 1935 a secretary. 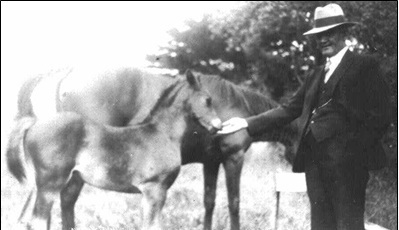 Joseph with foal – Hill Family collection. Among those actively connected with sport in general in the north of Auckland, there is, perhaps none so well-known as Joseph Stanaway, secretary of the racing’ club at Dargaville. Joe is a very busy man these days for in addition to being’ prominently identified with the sport of kings he is also secretary of the Northern Wairoa Rugby Union, the Jersey Cattle and Industrial Show Association and several other concerns. He is a hustler and has the reputation of being able to surmount most difficulties which arise in sporting circles. He certainly has a way wid him. There is no movement for the betterment of sport in which he has not a prominent part. Joe seems to have been identified with such things since Dargaville was very young, or rather since Joe himself, was very young. On 4 December 1936 one of Joseph’s daughters, Mary Agnes dies. She was married and had six children. Joseph Patrick Stanaway – Hill Family Collection. On 11 June 1937 Joseph dies aged 65 years in Dargaville, northern Kaipara (Death certificate number 1937/26623). Saturday The death occurred suddenly last evening of Mr. Joseph Patrick Stanaway of Mangawhare, a resident of the district for the last 46 years. Mr. Stanaway was to have officiated at the children’s section of the convent school fancy dress ball in the Hibernian Hall last evening. When he failed to put in an appearance at the hall two of his sons, Messrs. Joseph and David Stanaway, who had left home after him, began a search. It was not until 9.15 p.m. that Mr. Joseph Stanaway found his father in a crouched position at the back of a garage located behind the hall. Father Devolder and Sergeant Culloty, both of whom were attending the ball, were called, and Mr. Stanaway was carried to the presbytery nearby, but when Dr. Dreville arrived he was found to be dead. Mr. Stanaway was born in Helensville 65 years ago. At 19 years of age he came to Dargaville, where he worked in different capacities, being for some time captain on one of the river rafting steamers, and later bush manager of the Lamb Timber Company. He was for many years secretary of the Dargaville Racing Club and also of the Hobson Acclimatization Society. As secretary of the Northern Wairoa Jersey Breeders’ Association he was responsible for the holding of various shows. For some years he was secretary of the Northern Wairoa Rugby Union, and also timekeeper for the Dargaville Boxing Association. 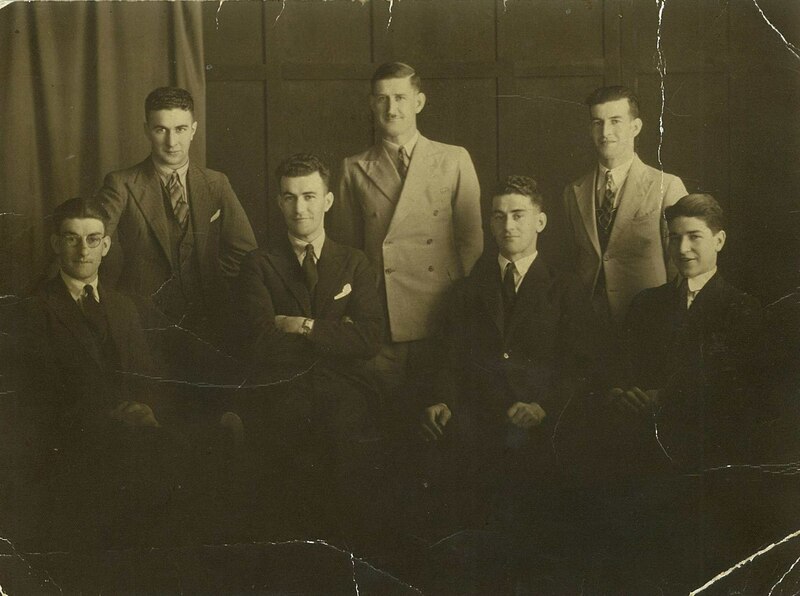 Mr. Stanaway is survived by his wife and an adult family of seven sons and three daughters. An inquest was held and the coroner, Mr. J. A. McLean, returned a verdict that death was due to heart failure. He was buried at the Mt Westley Cemetery in Dargaville – Block C plot 282. Ethel out lives her husband and passes away on 21 October 1970. I believe this may be the first young adult pic of my grandfather Leo I have seen. Des looks a bit like my cousin Daniel.